The Comprehensive Planning Committee meets every 2nd Wednesday at the District offices [9610 Long Point, Suite 130] from 9:00 am-10:00 am. 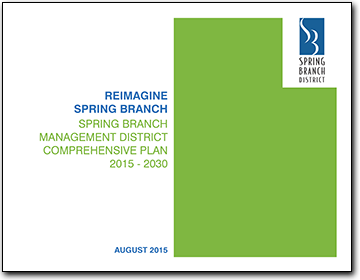 The Spring Branch Management District is approved for a grant from the Houston-Galveston Area Council to conduct a Livable Centers study to facilitate improvements along Long Point. The goal of this study is to identify areas of opportunity to improve multi-modal mobility (pedestrian, cyclist, and vehicular traffic), increase the ease of walkability for the residential areas, promote business development, and stimulate economic growth. 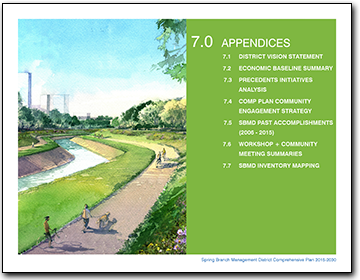 The District is also aspiring to create a Hike-and-Bike Trail through the district, connecting the Addicks Reservoir to White Oak Bayou. This trail is part of a bigger picture that includes the Energy Corridor, Memorial, Brays Oaks, International, and East Aldine Management Districts, TIRZ 17 and 20, City of Houston Parks Board, State Commissioners, TXDot, and the Houston-Galveston Area Council to connect the entire city through Hike-and-Bike Trails. This project hopes to increase the number of cyclists on trails and decrease the number of cars on Houston roadways. Another project aimed at improving the quality of life throughout the District is the detention and drainage initiative designed to mitigate areas of chronic flooding. To this end, the District is conducting studies to identify areas of flooding concern and working towards creating opportunities to relieve those areas and the citizens affected.